Llanmihangel Mill lies in the prettily wooded gorge known as The Collwyn carved out by the river Kenfig between Pyle Church and Marlas Farm. It is said to have ceased working shortly before the outbreak of the Second World War, but locals say that the last miller brought his family here in the early 1950's. Finding the machinery still intact, he set everything up, pulled the lever, and the old mill operated one last time. Today the leat that supplied it with water is dry; the wheel lies rusting, and the old machinery is still, quietly rotting away. secured a lease upon it in 1527. Following the dissolution of the abbey the mill was acquired by the Mansel family as part of their purchase of the former monastic estates. At the time there were three other corn mills operating in the area, but by 1700 Llanmihangel was the only one still working. All Margam tenants in the district who wished to have their corn ground were required under the terms of their tenancy agreements to bring it here and pay whatever rates and dues were being charged. This virtual monopoly meant that the mill thrived, and in 1724-5 considerable renovation work was carried out which probably involved the construction of the handsome little mansion house that adjoins it today. By 1739 a drying kiln had been added, and by 1751 machinery for a second mill had been installed in the interior. The tenant at this time was Edward Harris (died 1756) who was Portreeve of Kenfig Borough for fourteen consecutive years. Originally a carpenter employed on the Margam estate he worked his way up in the administration to a position of some importance. He also acquired the tenancies of a large number of Margam properties in the district including Llanmihangel Farm. One of the more unusual services he performed on behalf of the estate was to keep a boar at the mill that was available to tenants for breeding purposes. Harris lived in the little mansion house adjoining the mill which was burgled by some of the local inhabitants in 1747. Their 'loot' included, amongst other things, a brass "tea-kettle" or teapot. Tea at this time was a very valuable commodity, and the possession of such an item is an indication of just how far Edward Harris had come up in the world from his days as a lowly carpenter. Another burglary occurred here in 1753. This time the mill itself was the target and on this occasion the culprits were a local woman called Hester Thomas and her young daughter Elizabeth. They were disturbed whilst stealing corn, and Hester was subsequently brought to trial, though the outcome is unknown. A few years later however she was convicted of stealing corn from a farm on Stormy Down, and was publicly flogged through the streets of Cardiff and Cowbridge as a punishment. 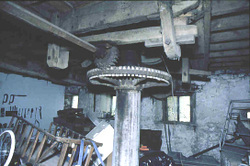 Perhaps one of the most unusual stories connected with the old mill occurred in the early part of the 19th century. In 1833 an eleven year old girl named Ann Thomas was at the mill when her clothing became caught in the machinery, "which machinery whirled her about with such violence as to mangle her whole frame in such a shocking manner as caused her instantaneous death". Ann was the daughter of a carpenter named Thomas Thomas living on Pyle Green. Eight years later he was employed to carry out repairs on the waterwheel. For some reason this was not stopped whilst the work was done. "His foot slipt or entangled in the said water wheel, so that his head went between the said water wheel and the wall, by means whereof the said Thomas Thomas then and there instantly died". It is almost as though the old mill had a personal grudge against the family! A public footpath runs alongside the river from the mill bridge to passing the weir that formerly supplied the water to drive the mill wheel. The present structure probably dates from the 19th century, and was landscaped some years ago to create an attractive feature. Some sort of dam has probably stood here since the mill was first built, and in 1670 Elizabeth Cradock of Llanmihangel went to court in order to secure access through adjoining property for urgent repairs to be made to it. A little further along the Collwyn towards Pyle church a flight of steps leads down to a small spring at the very edge of the river. Known as Ffynnon Collwyn it was formerly a healing well, the waters of which were claimed to have medicinal properties. As such it attracted pilgrims from far and wide including a bard called Dafydd Benwyn. He claimed to have been cured by its waters and in 1580 wrote a poem extolling the spring's virtues. The mill and its adjoining house are private property to which the general public are not permitted access, but both buildings can be seen from the adjoining lane.